89 Marlborough is located on the north side of Marlborough, between Berkeley and Clarendon, with 87 Marlborough to the east and 273-279 Clarendon to the west. 89 Marlborough was built ca. 1867 for attorney William Everett. William Everett was unmarried and lived in Winchester, and appears never to have lived at 89 Marlborough. The son of former Governor Edward Everett, he had graduated from Harvard Law School in 1865 and was admitted to the Suffolk Bar in 1866. He practiced law only briefly. He taught Latin at Harvard from 1870 to 1877, and in 1878 became Master of Adams Academy in Quincy. He served one term in Congress from 1893 to 1895, and was an unsuccessful candidate for Governor in 1897. He acquired the land for 89 Marlborough on April 7, 1866, from real estate dealer James Thomas Eldredge. James T. Eldredge and his wife, Ellen Sophia (Williams) Eldredge, lived in Roxbury and later would live at 199 Beacon. He had purchased the land on October 7, 1864, from Nathaniel L. Williams, who had purchased it from the Commonwealth of Massachusetts on June 27, 1863. Click here for an index to the deeds for 89 Marlborough. 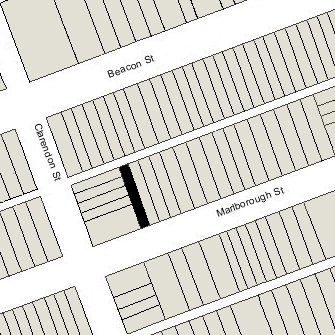 Between February and April of 1866, William Everett also acquired the three lots further west, extending to Clarendon, assembling a parcel of with a frontage of 103 feet on Marlborough and 112 feet on Clarendon. 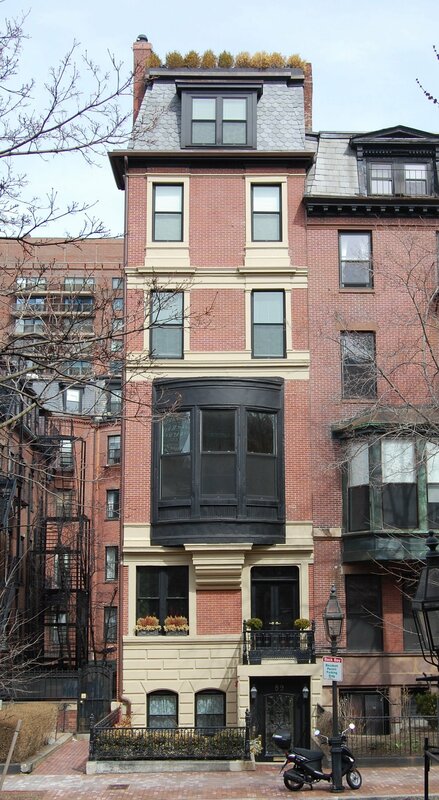 He had 89 Marlborough built on the eastern lot with an 18 foot frontage and sold the remaining lot with an 85 foot frontage on Marlborough to building contractor George Wheatland, Jr., who had 91 Marlborough and 273-275-277-279 Clarendon built on the lot. On April 1, 1868, 89 Marlborough was purchased from William Everett by Jacob Crowninshield Rogers. He and his wife, Elizabeth (Peabody) Rogers, made it their home. They previously had lived at 77 Marlborough. Jacob Rogers was a merchandise broker and agent for the North Bedford Copper Company. By 1885, he was agent for the banking firm of J. S. Morgan & Co. of London. When 89 Marlborough was built, the western wall was placed half on the lot for 89 Marlborough and half on the adjoining lot to the west, as was customary for party walls. The houses built by George Wheatland, Jr., were built as a block facing Clarendon and did not utilize the western wall of 89 Marlborough as a party wall. Accordingly, on March 1, 1869, Jacob Rogers acquired the six inch strip of land land and western half of the wall on it from George Wheatland, Jr., increasing the width of his lot to 18 feet six inches. On June 3, 1873, Jacob Rogers transferred 89 Marlborough into his wife’s name. 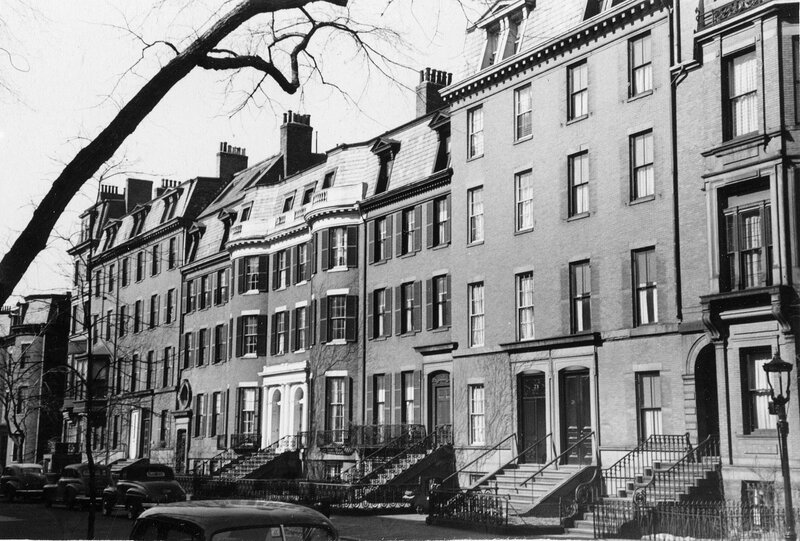 Between about 1875 and 1879, Jacob and Elizabeth Rogers were living elsewhere, and 89 Marlborough was the home of his brother, Richard Denison Rogers, and his wife, Martha Endicott (Peabody) Rogers, and of Francis Peabody and his wife, Helen (Bloodgood) Peabody. Martha (Peabody) Rogers and Francis Peabody were the siblings of Elizabeth (Peabody) Rogers. 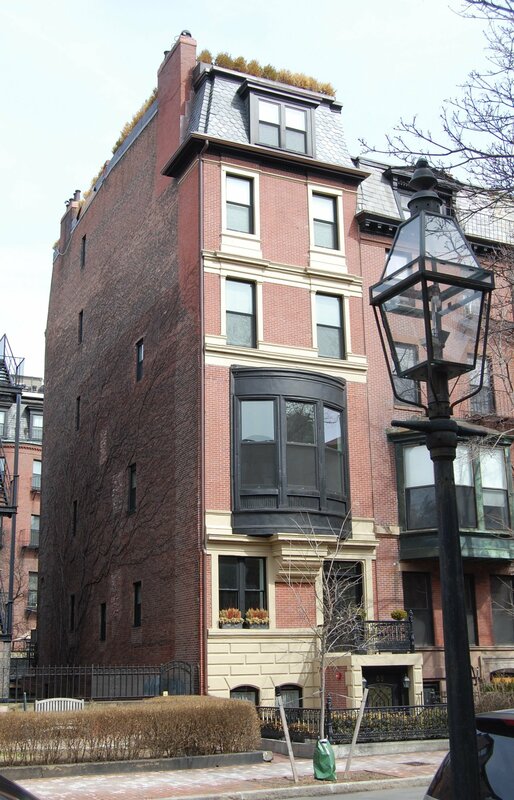 By 1880, Richard and Martha Rogers and Francis and Helen Peabody had moved to 88 Marlborough, and 89 Marlborough was once again the home of Jacob and Elizabeth Rogers. They continued to live there in 1885, but moved during or soon after the 1885-1886 winter season to a new home they had built at 231 Commonwealth (they are listed at both 89 Marlborough and 231 Commonwealth in the 1886 Blue Book). On March 15, 1886, 89 Marlborough was purchased from Elizabeth Rogers by Dr. William Norton Bullard, a neurologist, who made it his home and medical office. He previously had lived (and maintained his office) at 127 Boylston. His brother, Stephen Bullard, lived with him in 1899 and 1900. William Bullard married in September of 1900 to Mary Robbins Reynolds. 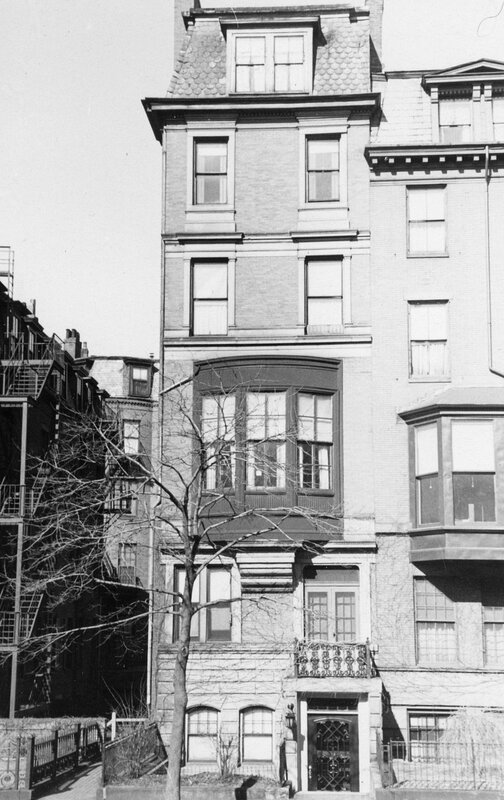 After their marriage, they lived at 89 Marlborough. They also maintained a home in Edgartown. 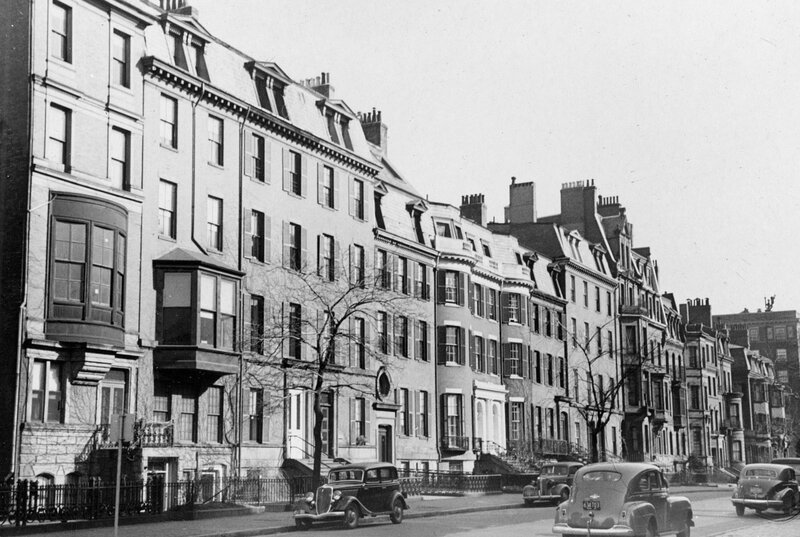 They continued to live at 89 Marlborough until about 1928, when they moved to Providence. On November 5, 1928, 89 Marlborough was acquired from William Bullard by Walter Howard Gleason. He was an attorney, real estate dealer, and investment broker. He and his wife, Mabel W. (Robertson) Gleason, lived at 183 Beacon. 89 Marlborough was not listed in the 1929 Blue Book. On December 28, 1928, it was acquired from Walter Gleason by Joan (Hearn) Denning, the widow of wholesale liquor dealer Lawrence J. Denning. She previously had lived at 161 Newbury. That same month, she applied for (and subsequently received) permission to remodel 89 Marlborough and convert it from a single-family dwelling and physician’s office into a twelve unit apartment house. As part of the remodeling, designed by Joseph E. Bennett, the front entrance was lowered to street level and a balcony was added where the former entrance had been located. Plans for the remodeling are included in the City of Boston Blueprints Collection in the Boston Public Library’s Arts Department (reference BIN P-57). After the building had been converted, she lived in one of the apartments until her death in January of 1939. When she purchased 89 Marlborough, Joan Denning had entered into a mortgage with Walter Gleason, which he subsequently transferred to himself as trustee of the estate of his father, Winsor Gleason. On May 28, 1941, the successor trustees foreclosed on the mortgage and it was acquired from them by attorney Fisher Keeler Rice. He and his wife, Pansy Vernon (Proctor) Rice, lived in Stow. The property changed hands, remaining an apartment house. On April 7, 1948, 89 Marlborough was acquired by Philip (Feibel) Brick and his wife, Anna (Landes) Brick, who lived in one of the apartments. They previously had lived in Lynn. Philip Brick died in October of 1953. On August 12, 1955, 89 Marlborough was acquired from Anna Brick by Ruth (London) Fleisher, the wife of Arnold Mellville Fleisher. They lived in Newton. The property changed hands, remaining an apartment building, and on March 25, 1964, was acquired by Rev. Lyle H. Huff, pastor of the Holy Ghost Cathedral in Roslindale. He lived in one of the apartments, where he also maintained a real estate office, and converted the apartment in the front of the basement into a small chapel. On July 2, 1964, he was notified by the Building Department of the need to obtain a permit to operate the chapel. Boston-Huff Pentecostal Enterprises replied on his behalf, indicating that the property was acquired for “an intown outreach” for the Roslindale church. The use as a chapel was subsequently discontinued. In October of 1967, Lyle Huff married to Nina M. Duerksen. On September 26, 1968, 89 Marlborough was acquired from Lyle and Nina Huff by John Jacob Rosenbaum, trustee of the Clinton Realty Trust. John Rosenbaum and his wife, Edna (Gordon) Rosenbaum, lived in Brookline. He was a real estate dealer. On January 2, 1979, the Clinton Realty Trust was amended to designate Donald J. M. Wilson as the trustee and his wife, Jennifer Mary (Ryston) Wilson, as the beneficiary. They subsequently divorced and on October 17, 2005, the property was transferred to Donald J. M. Wilson. He remarried to Jingling Wang, and on March 13, 2009, he transferred 89 Marlborough into both of their names. It remained an apartment building. On June 9, 2010, 89 Marlborough was acquired by Joseph M. Innello, trustee of the PMJ Trust. In February of 2011, the PMJ Trust filed for (and subsequently received) permission to remodel the property and convert it back into a single-family dwelling.